Rockwell Hitec MicroMixers are very compact Automatic Chemical Mixers for the high quality professional lab or other low to moderate volume user. They incorporate all the best features and more, of the larger Rockwell Hitec mixers whose technology has been well proven for over 20 years. They are fail safe, that is they will either mix correctly or, if that is not possible, stop and give warning. Mixing is in small batches ensuring optimum accuracy and fresh chemistry at all times. The mixers will supply one or more processors keeping the replenisher storage tanks full at all times. Due to the modular construction, 2, 4 or 6 solution units are available. The units are floor standing so can be adjacent to the processor or remote to suit the requirements of the lab. Simple to use calibration and diagnostic facilities are standard. Automatic mixing is now in the reach of any size of lab. Output: Up to 15 litres per hour/solution depending on process. 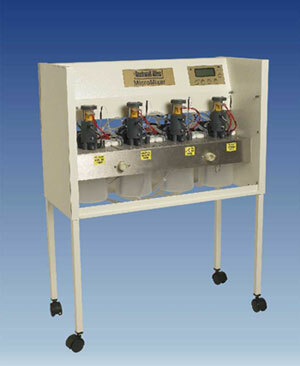 Water: Water at mixing temperature 1-5 Bar 1-3 litres/minute peak depending on specification.